160, Jalan Bukit Bintang, Kuala Lumpur. noon to 2.30pm, 7pm to 11pm, daily. 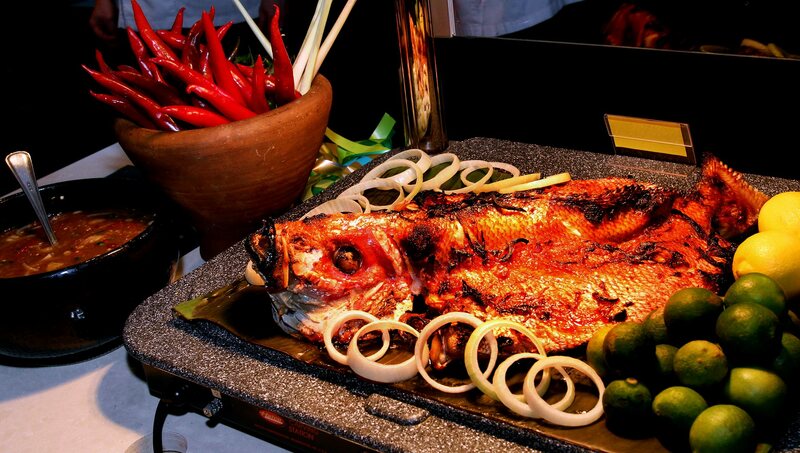 Buffet consists of Malay dishes and regional specialities. TWO Muhammads will be spearheading preparations for the Ramadan buffet spread at Grand Millennium’s The Mill restaurant this year — Muhammad Izal Rizqi Hamdan (better known as Bob) and Mohd Ali Noor Hashim. Under the direct supervision of executive chef Laurent Lherisson, the two chefs de partie will be leading The Mill’s kitchen team in serving up an array of Malay dishes and regional specialities. Bob and Ali Noor, who hail from Pahang and Malacca, respectively, will be tapping into their home states for ideas. Among the highlights are the Ikan Patin Masak Lemak Tempoyak and Tom Yam Gai (Thai Coconut Chicken Soup) by Bob, and Asam Pedas Ekor Lembu and sup kambing by Ali Noor. “Ikan Patin Masak Lemak Tempoyak is a traditional dish popular in Pahang. Locals may enjoy it more as it contains fermented durian, though the durian flavour isn’t overwhelming. “The Tom Yam Gai is prepared in the Bangkok style, which means it is spicier and has a creamier texture from the use of coconut milk,” said Bob, 29. Ali Noor, 46, favours the use of herbs to enhance his dishes, such as the sup kambing that has cumin, fennel, coriander powder and pandan leaves. “I used lemongrass, black pepper and daun kesum for the Asam Pedas Ekor Lembu, which is a sourish gravy-based oxtail dish from Malacca,” he said. Ketam Lemak Cili Padi dengan Nenas at The Mill. 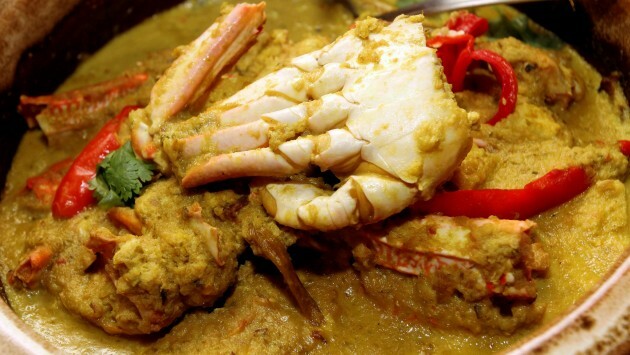 Ali Noor said other highlights include Roasted Baby Lamb, Oven Baked Lemongrass or sambal fish, gulai kawah (cauldron) dishes like chicken curry and gulai kambing, and a carving bar offering assorted fried seafood and poultry such as crab, prawn, roe, quail and squid. Themed “Nikmati Juadah Balik Kampung” (A Taste of the Village), the buffet includes other dishes like Rendang Daging, Ayam Masak Merah, Udang Masak Rendang Kerisik, Kupang Petai Asam Pedas, Ikan Keli Masak Berlada, Daging Masak Kicap, Gulai Perut dengan Rebung and Ayam Percik Kelantan. The four rotating menus also feature Indian, Japanese, Chinese and Western sections offering local and international dishes like pizza, pasta, maki, sushi, sashimi, Lamb Kofta, Paneer Tika Masala, Cauliflower Pakora, Spicy Vegetarian Mapo Tofu, Deep Fried Fish in Thai Chilli Sauce, Dried Chilli Fried Chicken, Fish Fillet in Provencal Tomato Stew, Braised Short Ribs Meat in Sweet Teriyaki Sauce, Turmeric Beurre Blanc Fish Fillet, Lamb Slice in Rosemary Sauce, and Raisin Couscous with Vegetables and Chickpeas. The Mill’s Ramadan buffet spread includes a selection of local and international desserts. For sweet endings, a dessert to look out for is the signature Indonesian Layer Cake, incorporating flavours like kurma, durian, pandan and cempedak. The buffet also offers a selection of appetisers, salads, condiments and desserts. The Mill’s Ramadan buffet will be available until July 28, from 7pm to 10pm daily. It is priced at RM108++ per person.